All culture items are listed in the Culture tab in Map View. Images imported onto a time-slice only display when the time-slice is turned on (see Import Images onto Map View). In the Control Panel, go to the Import menu. 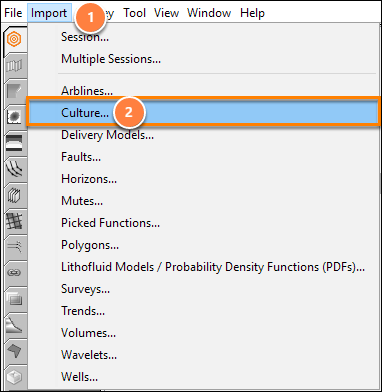 Select the culture file(s) to be loaded and click Open. 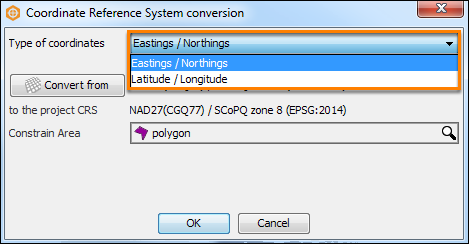 Shapefiles and Geotiff files may include coordinate information. 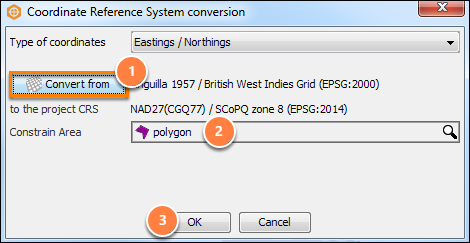 If the imported CRS is different to the project CRS, the Coordinate Reference System conversion window will be displayed. Eastings / Northings (i.e. X/Ys) or Latitude / Longitude coordinates. a. Specify the CRS of the imported culture. This will be converted to the project CRS (see Creating a Project for details on the project CRS). Note: If you are importing multiple culture files at the same time, the same conversion will be applied to all files. To include culture information in a Map View that is already imported to the project, see Working with Culture.